With the General Data Protection Regulation (GDPR) coming into force, Groupcall is educating and supporting schools across the country to achieve - and maintain - compliance. Groupcall offers a classroom-based GDPR training course to help organisations prepare for an ICO inspection or advisory visit. This CPD-accredited 1-day session is designed to help ensure your school or MAT avoids the pitfalls of potentially harmful data protection practice. Each module comprises engaging, bite-sized learning chunks, tests to check learning and an assessment at the end - successful completion of which earns the learner their CPD certificate. Groupcall’s GDPR Audit service identifies the areas where you are performing well against GDPR compliance – as well as highlighting those which require attention. The audit comprises a 2 day on-site visit from one of our GDPR practitioners to appraise how personal data is being processed and test the adequacy of the policies and procedures in place. Each customer receives a comprehensive report with recommendations to help you minimise data breaches. GDPR in Schools (GDPRiS) is a cost-effective software tool designed specifically to meet the needs of schools to ensure on-going compliance with data protection regulations. 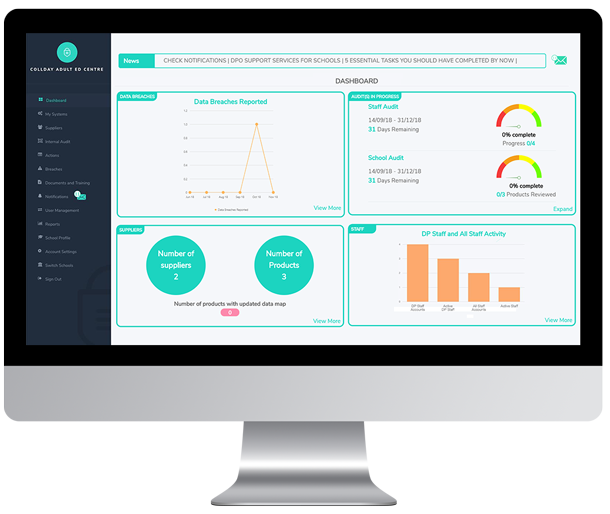 GDPRiS provides a whole-school approach to GDPR, simplifies processes and management and provides evidence-based accountability. All Fusion Forensics’ DPOs are experienced professionals trained to standards accredited by the British Computer Society (BCS) or Government Communications Headquarters (GCHQ). Groupcall has partnered Michelmores Solicitors, a respected legal firm with a strong pedigree in education. Michelmores provides a comprehensive data protection policy and external privacy notice service and can advise about specific aspects of your policy to ensure it’s tailored to individual requirements. Their ‘JustAsk’ service provides access to a solicitor as many times as required for a fixed annual cost – extremely useful for GDPR advice as well as any other legal issues you might encounter. Discover how Groupcall can help your school on the journey towards GDPR compliance.